The highway guardrail forming machine, also called the highway guardrail former, is designed into corrugated steel beam guardrail used in highway and sign post industry. 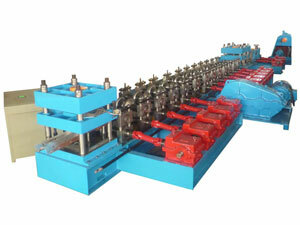 This machine has the simple structure and good performance. Our highway guardrail roll former from Changsheng Company offers good capacity and works safely and reliably. The highway guardrail can be manufactured to 2 – space, W beam guardrails, corrugated steel beam, sign posts and highway barriers. Since 1990, our company has provided highway guardrail roll forming machine solutions to the building and construction, automotive, HVAC around the world. Our experienced team consistently develops leading highway guardrail roll former designing, manufacturing and selling. New innovations, and an unrelenting quest for increased efficiencies with the right roll forming designs, can make your company's manufacturing process a profitable one. If you need a building solution with our highway guardrail roll former, please contact us.